John Swinney (Deputy First Minister) addressed pupils, staff and guests in the school before the plaque was unveiled. 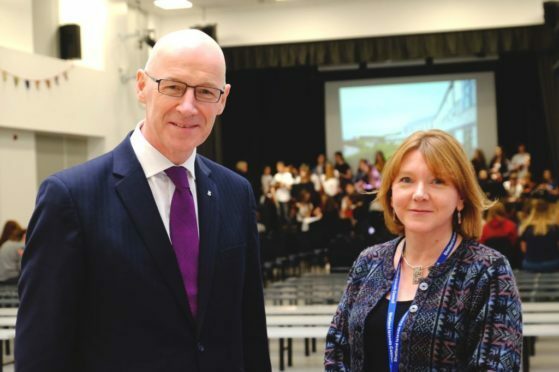 Anderson High School and halls of residence was formally opened yesterday by education secretary John Swinney, Deputy First Minister. At an event held in the school, pupils, staff and guests heard how the building will serve generations of young Shetlanders. A commemorative plaque set in a cairn, representing the pupils who travel from the outer isles, was unveiled by Mr Swinney. The school has been open to teachers and pupils for almost a year. Construction of the school began in August 2015, taking two years to complete the five floor high school, with 300 rooms and capacity for almost 1200 pupils. The halls of residence has capacity for 100 residents, and provides live-in accommodation for pupils from the outer isles of Shetland. Mr Swinney said: “I would like to thank Shetland Islands Council for inviting me to officially open the magnificent new Anderson High School which was constructed as part of the Scottish Government’s £1.8 billion Schools for the Future programme. “Young people attending Anderson High School now have access to first class state-of-the-art accommodation, and I am pleased the Scottish Government was able to provide almost £36 million to help make this happen. Two thirds of the funding for the construction cost of £55.75million for both buildings was loaned through the “Scotland’s Schools for the Future” programme. The buildings were designed by Ryder Architecture and the main contractor for the school was Morrison Construction.